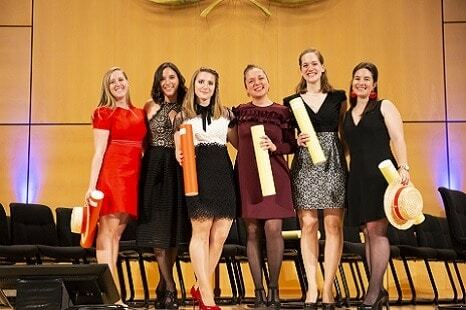 Marking the end of the student’s curriculum and the first steps into the professional world, the graduation ceremony is a major event for the Ecole Hôtelière de Genève. 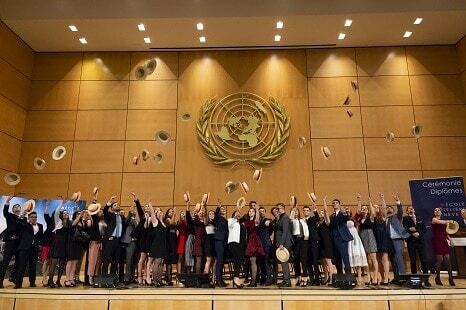 40 graduates received their diplomas from the Geneva Hotel School in the Assembly Hall of the Palais des Nations Unies surrounded by their families, hotel/restaurant partners, officials, the media and their teachers. A grandiose ceremony full of emotion and warmth. 500 people were present in the prestigious Assembly Hall where they attended the glory days of 40 EHG graduates. Dominique Louis, Master of Ceremonies, delivered a magnificent performance full of solemnity. Casimir Platzer, President of GastroSuisse, congratulated the graduates and shared his pride that they come from one of the best hotel schools in the world. The Director of the OFPC, Gilles Miserez, was full of praise. The intervention of the promotional sponsor Thierry Lavalley, General Manager of the Grand Hotel Kempinski Genève, was rich in advice and encouragement. Alain Brunier closed the ceremony by wishing his “new” colleagues every success as they will be able to shine the reputation of the Hotel Management School the globe. The Ceremony ended with the traditional canoe throw, the emblem of EHG graduates. As a former student, you will be in direct contact with EHG Alumni worldwide and will have at your disposal a new network of more than a thousand industry professionals. Stamms have been created on all 5 continents, with their ambassador all EHG graduates. Feel free to contact the Internship Office or our Alumni Ambassador to find the EHG alumni.